So you’re engaged, the first thought often goes to the wedding dress. Many brides-to-be start taking appointments to bridal-shop, but what if you’d like a custom-made dress instead? This week, I have interviewed two talented designers to guide us through the process of ordering your own bespoke dress. Louise from Louise Rose Couture and Lyndsey Clark from Lyndsey Clark Boutique. Their styles are very different but equally beautiful and unique. You can take a look at their work on their websites or Instagram accounts: Louise and Lyndsey. Hello ladies, could you please introduce yourself? Louise: My name is Louise and I own and run Louise Rose Couture, a made to order bridalwear label based in Reading. I design and create fifties inspired and less-traditional wedding dresses. All of my designs can be customised to create a unique dress that truly reflects you, whether you choose to go for an ivory dress, a bold colour or a floral print, there are no limits. The thing I love the most about my job is when a bride tries on her finished dress and lights up. I also absolutely love receiving photos of their big day, it’s the best feeling! Lyndsey: I am a designer-maker of bespoke and fantastical wedding dresses. I specialize in corsetry, and my style is usually gothic, steampunk and ethereal; very feminine, and a bit edgy. I have been a self-employed couture designer since 2009. I love my job, because every single project is totally different, and everything I make is deeply personal- I get to make wearable scrapbooks for brides; collecting up all of their ideas, and sentimental details and weaving them all together into something they cherish. Bespoke Wedding Dresses: why? What are the pros compared to ready-made dresses? 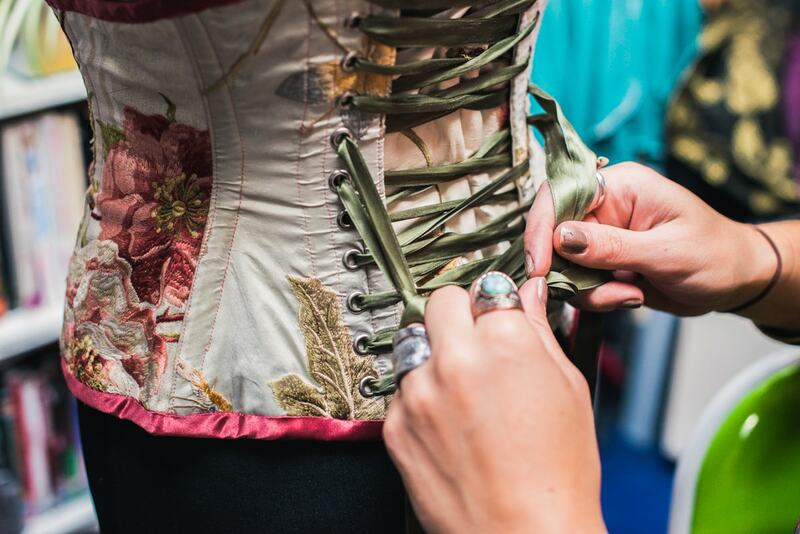 Louise: When buying a bespoke dress, you are not just buying a dress. 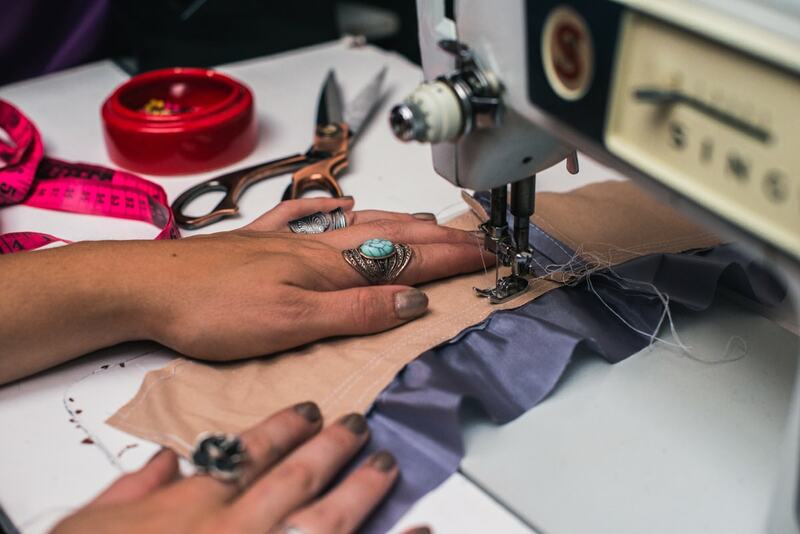 You are gaining the dedicated skills, experience and passion from a designer and maker, which will result in a one of a kind dress made from scratch, that was made just for you. I often hear from brides to be that they have tried on so many dresses and still can’t find the one. They wish they could have the top of this one, the bottom of that one, and the fabric of the other one. With bespoke, you can have just that. Every designer works differently, but personally, I have a range of base sample dresses with different overlays to help build up your design and help you visualise the final result. Therefore you can choose the silhouette, the neckline, sleeves, fabric and all of those important finishing touches so that you love every element of your dress. It’s an exciting process and knowing that it’s completely unique and no one else will have the exact same dress as you is a great plus. The design aside, another fab reason to go bespoke is that the dress is made to fit your body shape and as your gown is fitted during the process, there are no costly alterations at the end. Lyndsey: A bespoke dress will be unique, and made to fit you- it can be as bizarre as you dream! Louise: It can take a lot of imagination in the early stages. It’s very different to choosing a dress off the peg, because with bespoke your dress doesn’t exist yet, so you have to trust that it will turn out how you imagine from a sketch and the fabric samples (and perhaps some sample dresses you’ve seen and tried on from the designer). However, it’s not as daunting as it sounds. Designers create a ‘toile’ before cutting into your bridal fabric, which is a mock-up of the design in a calico fabric, used for fitting purposes and to check the design. This is your opportunity to start to see your dress coming together and make any tweaks to ensure you are happy with your chosen design. Lyndsey: You will often pay more for a bespoke dress because it isn’t an off-the-rack design, but rather a one-off item, custom made for you. But this isn’t always the case, sometimes you can get bespoke items for a lot less than the cost of off the rack dresses. What would you say it’s a realistic price range to have a bespoke dress? Louise: Some brides worry that a bespoke dress will not fit into their budget, and whilst a bespoke dress can seem expensive, it is more accessible than you might think and can often still be in line with buying an off the peg dress (according to Brides Magazine, the average spend is £1,400). On the other hand, some brides believe that having a dress made is a cheaper option than off the peg, and although this is not the case, you get a lot of value for money with a dress that has been made just for you. A realistic budget to have your dress made, on average, could be £1100-1600, although the sky is the limit with bespoke so this could increase dramatically from one design/designer to another, which is why it’s important to discuss your budget with your designer before your initial consultation. Lyndsey: In general I’d say upwards of £500. My bespoke designs generally range from £1300- £2500. Louise: There are many things that factor into the price, although the sheer amount of working hours spent making the dress is the obvious one, it is by no means the only factor. Firstly, there is the bridal fabric which can be very expensive. Alongside this, there is also the consultation time and fitting appointments, followed by the time spent making any alterations. Creating the pattern and toile also takes time, if you are not choosing a design from the sample collection. There is also either the rent on premises or the commission that you pay to the shop if you sell through a boutique. 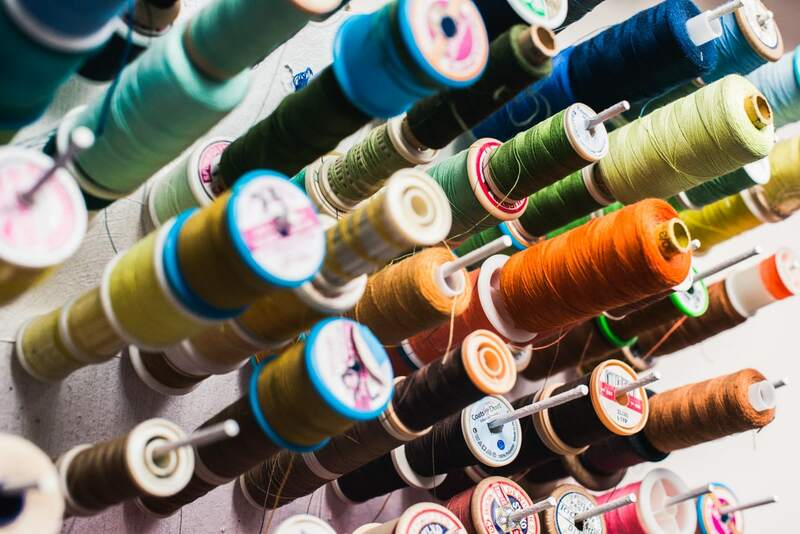 Hopefully, this helps give some insight into the cost of having your dream dress made. Lyndsey: The price really depends on the style of dress, how structured it is, how elaborate it is, the materials used, the lead time given (remember to allow the designer enough time to make the dress!). How long can realistically take from consultation to delivery of the dress? Louise: It can vary depending on factors such as current workload and complexity of the design, but 3-6 months is a realistic time frame to allow for fitting appointments. However, I do get enquiries up to 18 months before the big day and we schedule the timings accordingly. Lyndsey: I usually ask a minimum of 6 months for a custom made, bespoke dress, ideally longer- more like a year. Sometimes I am more flexible, but generally the further in advance, you begin the process, the better. 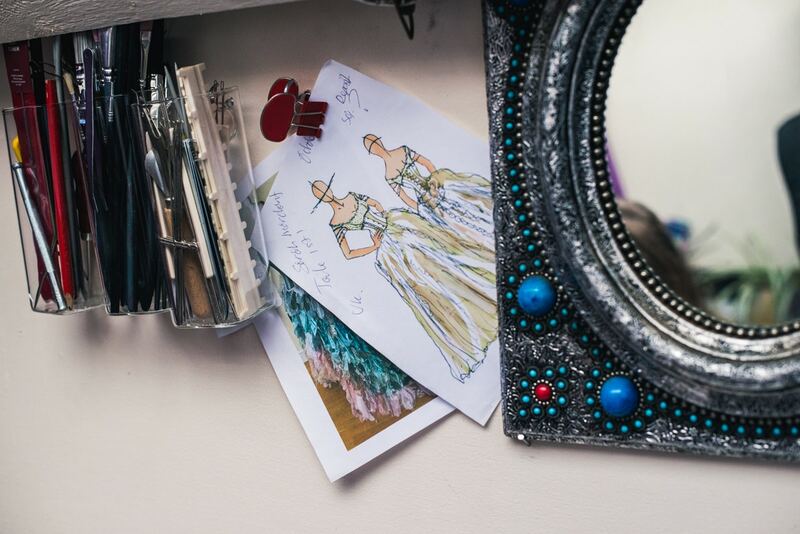 So I would like to have a bespoke wedding dress… Where do I start? How to start on the right foot? Louise: Start by researching different designers to find one that’s right for you. 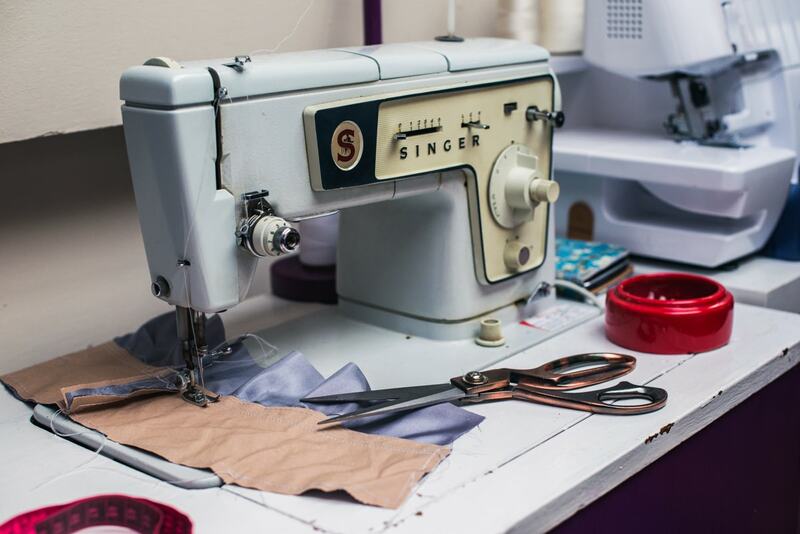 Each designer has their own style that you will see come through in their designs, so it’s important to find the right fit for your vision to get the best out of having your dress made. Ask yourself what style and direction you want to go with your dress, and find a designer that fits with that criteria. Once you’ve found your chosen designer, get in touch for a chat and book in a consultation. It is best to provide an indication of your budget and any initial ideas you have before the consultation so that the designer can make sure they have samples and designs ready to show you that fit within that so that you get the best out of your consultation. Lyndsey: It’s very easy; just send an email! Contact the designer, maybe send an outline of what you are looking for, a few pictures, perhaps a Pinterest board. Just something to get the initial ideas across. Be sure to let them know where you are based, and when your wedding is, to make sure they have the info they need in good time. They will then get back to you and let you know the next steps. Louise: Some brides feel they have to go super traditional with their dress in order to feel like a bride. When actually whether you go for ivory or a bold colour, a long dress or a short one, the only thing set is for you to feel amazing on your big day and for your dress to truly reflect you. Lyndsey: The most common issues I find are customers forgetting that everything I make is made entirely from scratch. So the lead times quoted are real; I’m a real human, sewing everything together- not a factory line. Another common issue is brides arranging to have an item custom made and then beginning a frantic pre-wedding weight-loss regime, which can be problematic when you are having a dress made to measure. Remember that your partner loves you, and wants to marry you- and all of your guests love you, and think you are beautiful. So try not to get too caught up in losing weight and dieting- you’ll look beautiful regardless. I would suggest making an appointment in a wedding dress shop and trying on lots of styles, to find a shape that suits your body, before you get anything custom made. You may find that the style you have in your head really doesn’t suit you, and that style you can’t imagine ever wearing actually makes you feel like a goddess. Great post Berni, I truly respect bespoke wedding dressmakers, they graft!! This is great, massive fan of doing things in an alternative way! Blown away by the advice and photos on this blog Berni!